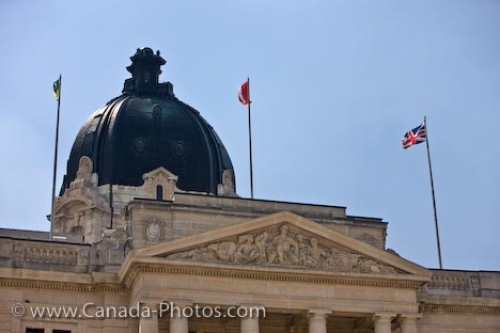 Beautiful details of the historic Legislative Building in the City of Regina. The Legislative Building is located in the City of Regina. This historic building is filled with architectural details. This beautifully detailed architectural style is Beaux Arts. The large dome sits at the center of the building along with three flags. Legislative Building in the City of Regina, Saskatchewan, Canada.